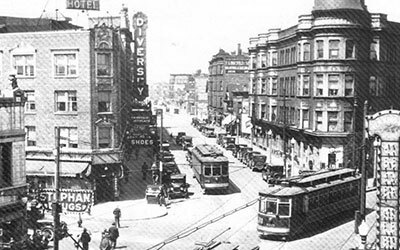 The new Hotel Versey has been known by many names, like the "Rock and Roll Days Inn" and the "Chicago Boutique Hotel - Days Inn on Diversey," but its history is all its own. Many musicians and performers have stayed at our historic Chicago hotel throughout the years, and few hotels can boast a guest list that includes the Foo Fighters, Nirvana, Smashing Pumpkins, Wilco, Red Hot Chili Peppers, and the Black Keys, to name a few. Back in the day, bands staying at the hotel meant Kurt Cobain and Courtney Love dying their hair in the bathtubs, Sheryl Crow rollerblading through the lobby (not permitted), a front desk clerk doing laundry for the Goo Goo Dolls, and Alanis Morissette bringing sushi to a front desk clerk. Many nights you could see musicians sitting in the lobby playing guitar. Today, bands still frequent the hotel. While not as much as in the Rock and Roll days, their stories live on. We're dedicated to keeping our unique heritage alive, and look forward to sharing it with you at Hotel Versey in Chicago. If you have any good Days Inn band stories, we'd love to hear them. Send us an email and share your experience. 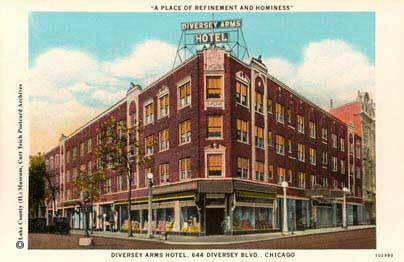 The Diversey Arms Hotel in the 1920s - In 1925, jazz musician Bix Beiderbecke lived in the building known at the time as the Diversey Arms Hotel (historic name of the Lincoln Park Hotel). He played with Charley Straight's Orchestra at the Rendezvous Café, located on the corner in the same building at 622 Diversey (corner of Clark & Diversey). Another legend, Red Nichols, stayed with Bix for a while. Joe E. Lewis at the Rendezvous Café - On October 15, 1927, comedian Joe E. Lewis told the owner of the Green Mill Café that he was leaving to work at the New Rendezvous Café. The next day, gangster "Machine Gun" Jack McGurn, part owner of the Green Mill, met Joe outside the Commonwealth Hotel at 2757 Pine Grove Ave., where Joe lived for seven years, and told him "You'll never live to open." Joe grinned and told him, "I open on November 2, I'll reserve a table for you," then walked away. On January 28th, less than eleven weeks after his throat was slashed, Joe E. Lewis opened again at the Rendezvous here at 622 Diversey while bodyguards stood on the roof across the street to protect him. The place was sold out. Ted Healy of "Three Stooges" fame and Sophie Tucker canceled other engagements to be in the show with him.